Help keep your curious tot in the child-friendly areas of your home with the Safety 1st Vintage Grey Wood Doorway Gate. This attractive wooden gate has an understated look that blends easily with many different home decors. The pressure mount design is great for hallways and doorways and can be moved easily to where you need it for the day: No tools required. The gate expands from 28 to 42 inches which allows you to quickly adjust for openings of different widths. For families with pets, this makes a great pet gate too. Whether you have a cat or a dog, this pressure-mounted gate is easily adjustable and lets you create a pet-friendly area within your home. And because it is a tension-mount solution, it is simple to install in a door or opening and remove again when not needed. SECURE AND STURDY - Gate features a durable wood frame. It also includes non-marring bumpers to protect your woodwork from unwanted dings and scratches. 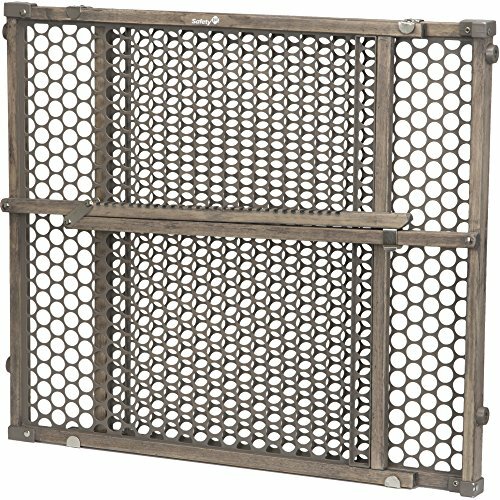 COMPACT DESIGN - The Safety 1st Vintage Grey Wood Gate slides together for storage so that it can easily be put away and out of sight when it is not being used.